Not Your Mother's Math Class: Freebie - Word Problem Operation Sort Add or Multiply? Freebie - Word Problem Operation Sort Add or Multiply? It is crucial for students to understand multiplication as repeated addition. We often start teaching multiplication this way but then we let it go once students begin to learn multiplication facts. The relationship is the reason that word problems using addition and multiplication use similar words like combined and altogether. We need to help students make connections between different curricular units in math. Some of them may seem obvious to us but they are not obvious to our students. 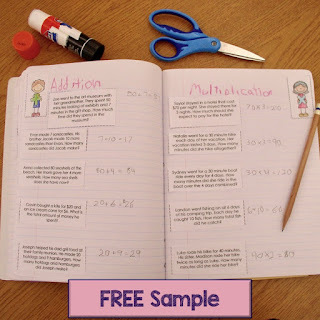 When we introduce multiplication we often put addition and subtraction on the back burner. It is pretty natural to focus on the new unit we are teaching. Students assume that the word problems they are solving will use multiplication without needing to think about which operation to use. This is harmful when they need to solve a variety of word problems, as often happens in high-stakes testing. I created addition and multiplication word problem sorts to help my students practice solving word problems. Who doesn't need more practice with word problems? Like all my free samples this download stands alone (you can use it without purchasing anything else). 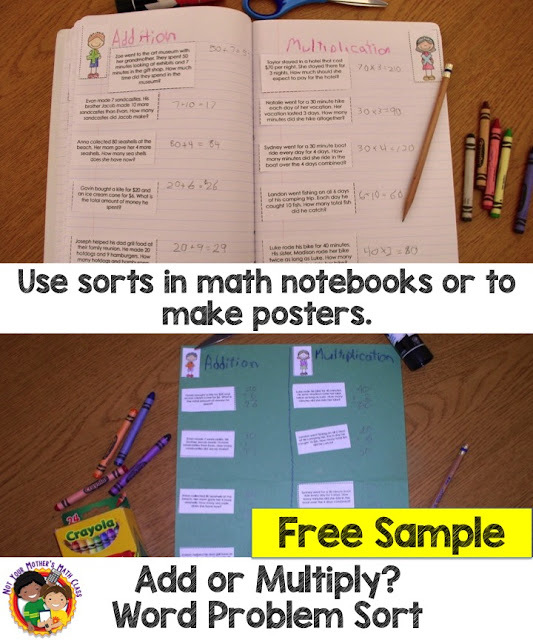 The free sort focuses on adding or multiplying multiples of 10 by 1-digit numbers. Click here to get the free download. To see all my freebies, click on Freebies at the top of the page.